GoodAccountants.com came to our rescue. Many of our other clients have packed up and gone out of business but we actually increased our overall billings during this same period of time as a result of all the clients we’ve landed from GoodAccoutants.com. We’ve gotten a variety of clients from them ranging from 1040′s to a $12 million dollar commercial landscaping company based in San Pedro, California with more than100 employees. We recently engaged a $6 million, 25 year old, food safety and nutrition company based in Westlake Village, California from GoodAccountants.com that has become a $25,000 dollar annual client of ours. Their bookkeeper of more than 20 years had retired so they contacted GoodAccountants.com for a replacement but were advised by Patty Schoenfeld of GoodAccountants that our firm could do the same work for them on an outsourced basis more cost effectively so they agreed to retain us. 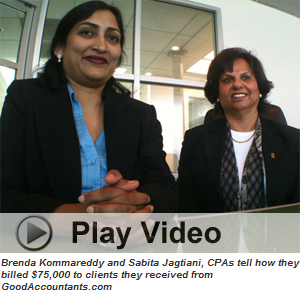 The folks at GoodAccountants.com are for real and they have worked very hard to match us with the type of clients we look for. When we first joined GoodAccountants we started to get worried because the first six months did not produce stellar results for us but then we suddenly began engaging much bigger clients from them. Marketing is something you have to commit to just as you commit to a particular profession; you don’t stop being a doctor because you may have lost your first patient. We’re so glad we kept renewing our membership because now we are seeing a two to three times return on our investment in the first year alone and the clients are staying with us year after year.So we recently decided to upgrade to their $25,000 marketing program which guarantees us $75,000 in billing. To use the word ‘love’ is pretty strong however when somebody is giving you the kind of clients they’re giving us then we have to say we love GoodAccountants.com.